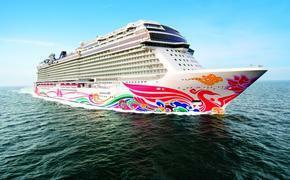 Disney Cruise Line has dramatically enhanced its Disney Wonder, and “Frozen” is featured onboard in a very big way. In summer 2015, the Wonder first hosted a theme cruise dedicated to Queen Elsa, Princess Anna and friends that we then experienced, but now the software overlay has given way to a grander hardware and main production show presence that we have now witnessed on the ship’s initial return to sailing after a massive 53-day dry-dock refurbishment. To start, Disney’s Oceaneer Club kids facility has been redesigned with a space dubbed “Frozen Adventures” and intricately themed to Wandering Oaken’s Trading Post from the hit animated film. Here, Anna and Elsa show up for a coronation ceremony, and Oaken himself pops up periodically in his makeshift sauna – singing “Let It Go” and amusingly weeping while getting to the line, “you’ll never see me cry,” explaining “well, maybe just little.” Belting a friendly “hoo, hoo” will surely make him see past his temporary melancholy, however. Meanwhile, the space displays tons of little details from cans of lutefisk and wooden troll carvings to digital windows to the snowy outdoors. Other interactivity comes in the form of a video game starring everyone’s favorite Olaf snowman as well as an array of iPad terminals. The rustic setting is a fun juxtaposition to the other new modern Marvel Super Hero Academy across the way. 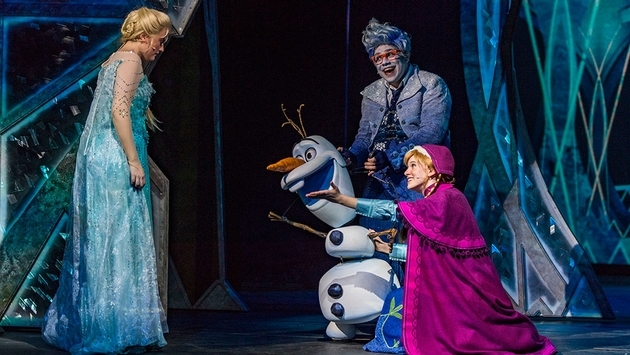 For the whole family, the brand new “Frozen, A Musical Spectacular” has replaced “Toy Story, the Musical” as one of the Wonder’s three main production shows, and everything about it proves why Disney continues to be the cruise industry leader for onboard entertainment. The wonderfully talented 18-person cast alone, including Broadway performer Michael Mendez as Olaf, makes the 55-minute musical a surefire winner. Particularly effective are the use of adorable puppets for the royal sisters as children, reindeer Sven, one of the kid trolls and, of course, Olaf. Elaborate moving scenery, curtains and scrims are all activated with perfectly aligned projections mapped to different surfaces, extending to the stage floor and outer frame plus house side walls, creating an illusion of great depth. Even snowy atmospheric effects draw the audience into the action while other prop and costuming effects convincingly sell challenging scenes, no small feat on a cruise ship. Altogether, every element is in service to telling the film’s narrative uniquely on a shipboard stage, where character dynamics are expressed in fresh ways, like the fun interplay between Sven and Olaf and even the sisters themselves, who are also exceptional vocalists. Disney’s storytelling and stagecraft always pull at the heartstrings, and “Frozen” is another perfect example of the company’s emotional prowess.